Meet your guide at 11:00 AM (arrive strictly at 10:45 AM) at our meeting point 5 minutes away from the Eiffel Tower for your visit. Meet your guide at 9:00 PM (arrive strictly at 8:45 PM) at our meeting point 5 minutes away from the Eiffel Tower for your visit. Meet your guide at 7:30 PM (arrive strictly at 7:15 PM) at our meeting point 5 minutes away from the Eiffel Tower for your visit. 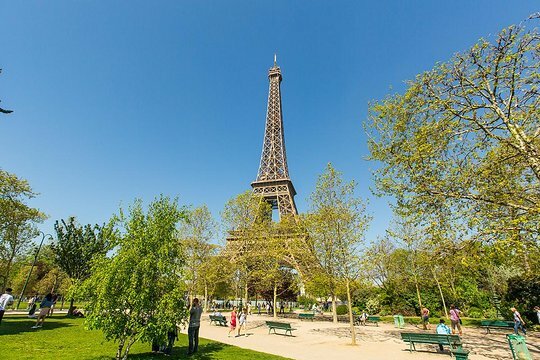 Breeze past the crowds outside the Eiffel Tower with this skip-the-line pass and 1.5-hour tour. In the company of your local guide, you'll gain priority access to the tower's second level. Delve into the history of one of the world's most famous monuments and soak up the exhibits and maps on display. Then bid adieu to your guide and head to the tower's summit for stellar views of the City of Lights. Toast your travels with a glass of bubbly from the Champagne bar (own expense). Meet your local guide at a prearranged meeting point a few minutes' walk from the Eiffel Tower. Your tour group is limited to 15 people to ensure personal attention from your guide and an intimate group atmosphere. As you approach the tower, skip the long waiting lines and proceed by elevator directly to the second level. Look around the second floor, which includes panoramic maps of of Paris and a 1/50th scale model of the tower's original architecture. Enjoy views of famous landmarks like Les Invalides, the Arc de Triomphe, the Louvre, and Notre Dame as you listen to your guide's engaging commentary. Once your guided tour has concluded, you may continue to explore on your own. Ascend a second elevator for access to the Eiffel Tower's summit, where you can get fantastic views from 1,063 feet (324 meters) up and purchase a glass of bubbly from the Champagne bar. 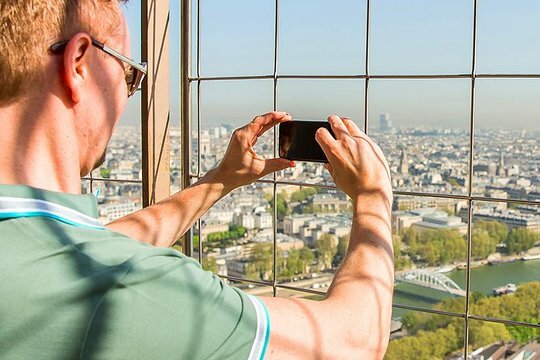 Get quick answers from Skip the Line: Eiffel Tower Tour and Summit Access staff and past visitors.